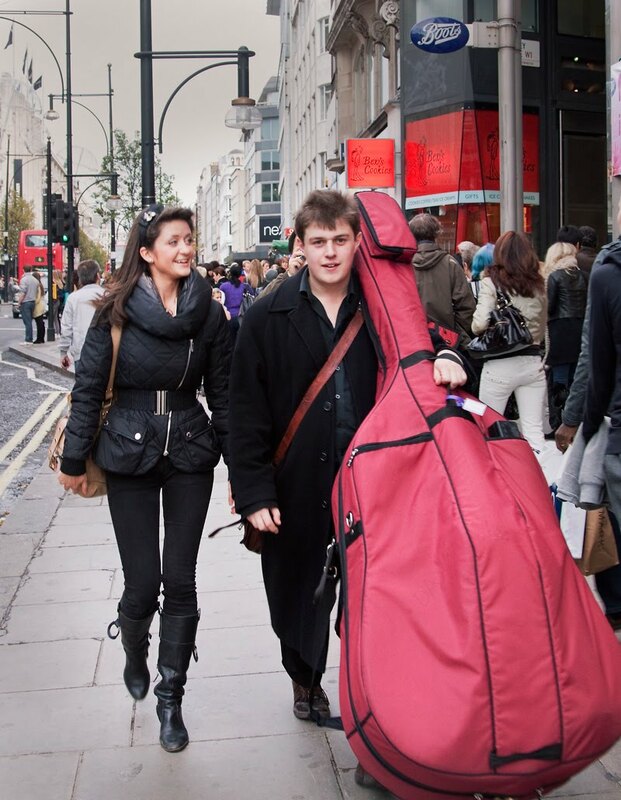 Very few people notice as a double bass takes a stroll down Oxford St.
Perhaps they are on their way to Wigmore Hall?? Of course they are paying no attention to the double bass - they are looking at the lovely lass beside it! 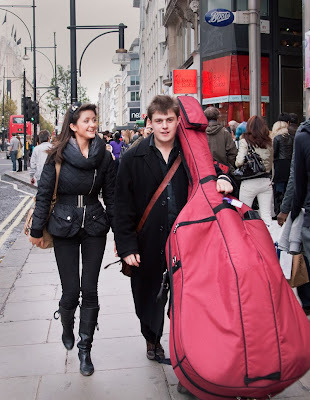 Well, in large cities like London (and my native NYC), a big instrument being lugged down the street in nothing in comparison to other, more horrifyig sights.... that people STILL just pass along by.... We city folk can get so jaded we don't get shocked by anything anymore. I'll tell you where double basses do get noticed: in the crowded halls of a music faculty where the whole double bass collective of the orchestra is lined up for the elevator to get to the practice rooms in the same hallway you need to take to get to class! Yup, then you notice them...try squeezing past four of those!!! Where's the orchestra rehearsal, I'll bring my violin! Maybe that lass could turn pages for me? Whenever I do rail replacement service, musical instruments are the only thing people are allowed to take on board (instead of the hold) without any problem. Although with a double bass like this, I will draw the line and try to find a good place down below! And I have to agree: he looks cute! wow you could fit a dead body in there! There are probably very few sights that would turn a Londoner's head .... love the pink cover! Great capture. It is amazing how we don't seem to be surprised by anything anymore. And in that color case too? Both look so small next to the instrument! Crikey, I'd take up the violin if I had to cart that big ole hing around! that's really funny, considering i passed by one just this morning on tottenham court road! Great cover! It it pink or red? Think that I wanted to play the cello but I never started 'cause I thought it too big when I was a child. Can a child ever start playing this one? Thats a big violin or he is really little! Lol!